Cardiovascular imaging is playing an increasingly important role in the management of cardiovascular disease. As new imaging technologies are constantly being introduced, this has only been bolstered. Computer systems have always provided assistance to radiologists in their clinical routine, but recent advancements in computational power and the improvement in machine learning algorithms have introduced new possibilities and applications for these systems. 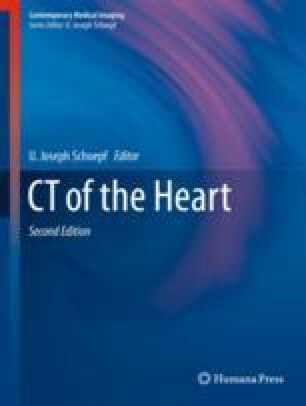 In this chapter, a brief overview of machine learning and artificial intelligence will be presented, discussing its applications in medicine and radiology, with a special focus on cardiovascular imaging applications. Grand Challenges in Biomedical Imaging. 2016. Available from: https://grand-challenge.org/All_Challenges/. Data Science Bowl. 2016. Available from: https://www.kaggle.com/c/second-annual-data-science-bowl. Precision Medicine Initiative. 2016. Available from: https://www.nih.gov/news-events/news-releases/nih-awards-55-million-build-million-person-precision-medicine-study https://www.nimhd.nih.gov/programs/collab/pmi/ https://syndication.nih.gov/multimedia/pmi/infographics/pmi-infographic.pdf. Artificial Intelligence Used To Detect Rare Leukemia Type In Japan. 2016. Available from: http://www.ndtv.com/health/artificial-intelligence-used-to-detect-rare-leukemia-type-in-japan-1440789. Sharpless N. As seen on 60 minutes: Watson accelerates precision oncology. 2016. Available from: https://www.ibm.com/blogs/think/2016/10/sharpless/. Shah SJ, Katz DH, Selvaraj S, Burke MA, Yancy CW, Gheorghiade M, et al. Phenomapping for novel classification of heart failure with preserved ejection fraction. Circulation. 2015;131(3):269–79. https://doi.org/10.1161/CIRCULATIONAHA.114.010637.